Sorry, I know that’s not my line, but it seemed appropriate. Just a small update post, I feel like that’s all I’ve been doing lately, but maybe I’ll get inspired to do some more substantive posts soon. I recently attended a new poetry workshop/group in Melbourne’s CBD. This group is organised by a woman called Vicki, and I heard about it through my other writing group. I went along, I took two poems, one called “Crush”, which I’ve posted here and one which was an homage to Paradise Lost, which I wrote a couple of weeks ago. It’s always a bit of a risk going to a new group because you’re never sure how strong the criticism is going to be, and whether it will be delivered in a sensitive manner. There were nine people there, five who were new to the group. We went around the table and I was a little bit nervous because there was this one guy, (everyone I’ve spoken to about it seems to feel there’s always this one guy), who was very opinionated, talked over others, and who seemed to insist on getting the last word in. I read out “Crush” and was a bit concerned about his response to my work, but he wasn’t as bad as I thought he would be. I had some interesting feedback from some of the other poets, so that’s good. I haven’t decided whether I’ll keep going to this group but I’ll go once more before making up my mind. The band I was involved with disintegrated recently, I guess I should be sad, but I think it had had its time. I’m looking for other opportunities to play bass, but in the meantime I got a piano keyboard (a present from Mum), and have joined a choir, so that’s keeping me busy till I find another band or regular jamming session to be part of. I may have to re-evaluate my goal of performing before the end of the year, but I’m going to try to do it anyway! If you’re a band looking for a bassist let me know! 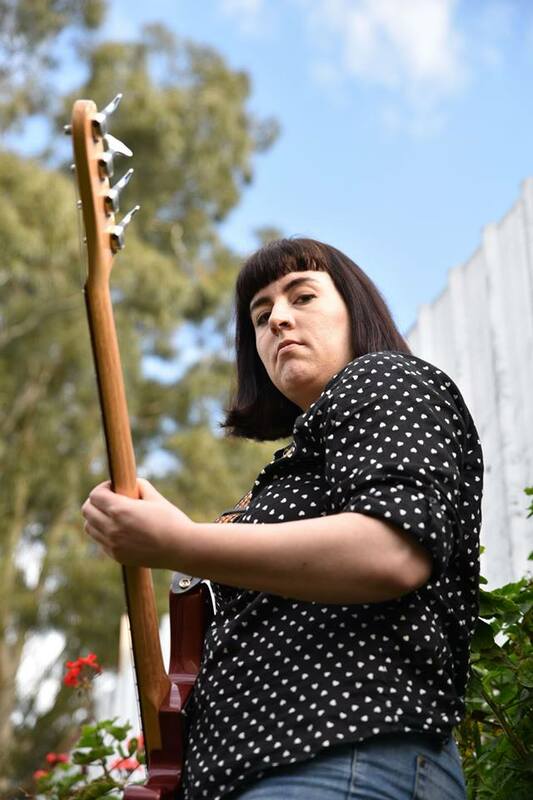 Here is a picture of me with the photographer Meiki’s bass and my new haircut. I’ve finished the initial draft of my third NaNoWriMo manuscript. It’s pretty dark and I really need to start going through it, but I’ve been feeling a bit avoidant. Part of me is worried that when I read it back I’ll hate it, but hopefully I’ll be pleasantly surprised. I’m setting tomorrow morning aside for it. I’ve been offered full time temping work for the next little while, so I’m enjoying the inflow of money, and given that I’ll be travelling in August I’m trying to earn as much as I can. I’ve been applying for ‘real’ jobs, mostly in HR, but I’m not going to take one just because I’m offered one. I think the temping will see me through until I can find a permanent job that really speaks to me. I’m not 100% sure what that means just yet, but I’m sure by being open to opportunities, one will come my way that’s just right.